You don’t have to look very hard to find folks in Northern Michigan who are proud to live and work here. The area is teeming with artists of all sorts — drawn here for the sense of community, the easy-to-find solitude, and of course the beautiful natural scenery that’s the backdrop for all four seasons. Each musician in Manitou Winds feels a deep connection to Northern Michigan. We each exhibit this connection in our own personal ways. For most of us, it’s clear in our choice of outdoor sports — hiking, biking, water skiing, boating, etc. But, our love of Northern Michigan and its four seasons has a deep resonance in the music we create as well. Rather than a celebration of the holiday season, our concert on December 5 (Winter Songs & Carols) will be an exploration of a season that tends to get a lot of “bad press”. Winter is not always an easy season to love. Some of our favorite restaurants and stores close up. A few dear friends fly the nest for warmer climes. 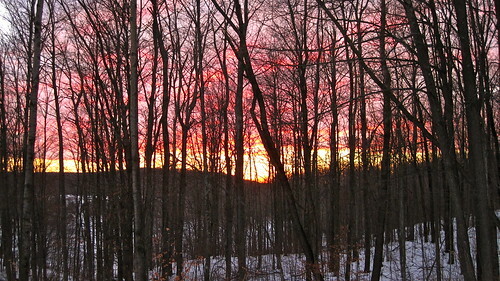 The sun is barely up before it starts to go down again — if you actually get to see the sun! And the snow… well, let’s just say you don’t want to cheer too loudly about news of an approaching snowstorm. You’re liable to have a snow boot aimed at your forehead. But, winter’s not just about those things that we give up — the departure of all those summer comforts. It’s also about those things that we gain. Winter brings a very special kind of quiet to nature. That unique peace and quiet can also come to us if we let it. The songbirds are mostly gone and we’re left with the sound of pine needles catching the wind, the knocking of branches, the scurrying of forest critters. Suddenly, these small voices are brought to our attention. Winter may make the outdoors less hospitable for some, but think of the warm comforts we can enjoy indoors — cherished time with friends and loved ones. 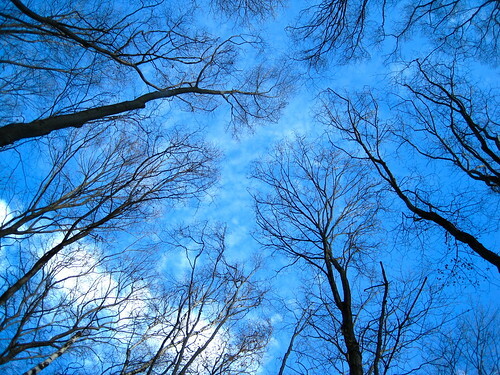 And think of winter’s beauty — more than just a silver lining in the clouds! When the sun breaks through on a bitterly cold winter’s day, you find yourself squinting at a world covered in silver, gold, and azure… maybe the inconvenience of the season isn’t too much to bear? 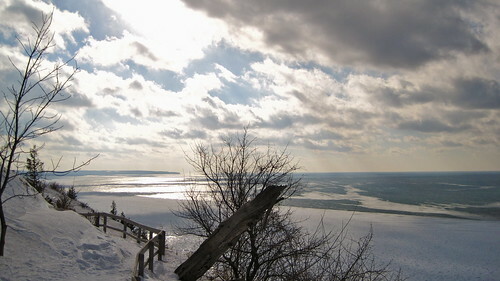 The beauty of a Northern Michigan winter… it’s why we had the idea to explore winter in music. It’s also why we came upon the idea of using local Michigan art to promote all of our concerts. We happened upon some of Vivi Woodcock’s lovely work during a summer weekend trip to Petoskey. 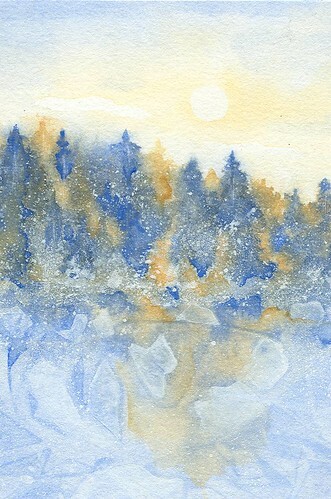 In her beautiful watercolor, Solitude, I could so clearly see the beauty of winter that we’re hoping to convey in our concert. 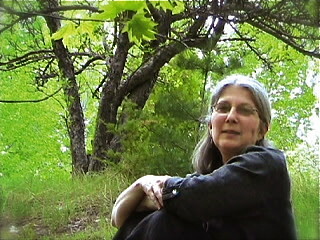 Vivi is co-owner and curator of the Northern Michigan Artists Market gallery in Petoskey. The gallery is always a great place to explore, featuring artwork in many different forms from more than 85 different Northern Michigan artists. Vivi’s own artwork is a combination of printmaking, collaging, and painting using various water media and other natural materials. Through the building of layers and the use of texture, she expresses the colors of nature that she loves. She studied art at the University of Michigan and has since created works for competitive exhibits and shows. She also works as a contract artist, designing logos, posters, stationery, and has illustrated books and catalogs. We certainly see that lively spirit present in her work — and you can too! Vivi very generously allowed us to use Solitude for our concert poster. To see more of Vivi’s work, you can visit the Northern Michigan Artists Market online. Better yet, you can stop into the gallery, talk with Vivi, and see her work in person. Collaborating and learning from one another is probably the most rewarding part about any artistic endeavor — whether you’re collaborating with fellow musicians to express the fullness of a musical line, or you enlist the help of a visual artist to help the audience fully visualize a dramatic concept. We look forward to being inspired by more Northern Michigan artists and showcasing their impressive work. For more information about Winter Songs & Carols, visit our Performances Page. For even more updates and insights, you can like us on Facebook.